This is a post that went live on the DCAM blog January 31, 2017 but I forgot to post it here OOOPS. Greetings DCAM friends and fellow crafters. LeeAnn here today with a few projects I have made this crazy month and really wanted to share. I have to honestly say I have had so much fun with these new dies, and have another project in the works. So let me stop and show you what I did... Using the Wine Tag Die, Cheers Die and It's a Girl sets I went about this door welcome sign. Using Pink Recollections card stock for the base, followed by White Recollections and then the top layer is Vellum that has pink footprints on it. I have honestly had this paper for 2 years waiting for a chance to use it. I used my Xyron X to affix all the pieces to the vellum. I used Zots to affix the vellum to the base and my e-z runner to affix the cardstock layers. Next I made a bottle tag. This one is using the Wine Tag and the Cheers sets. Again I am using paper that has been in my stash for a while, starting with the base which has a marbled look. I then used my stitched circles to cut a circle larger than the Raise a Toast ring out of gold shimmer card stock. I cut a black circle the same size as the ring as well to help it with coloring. 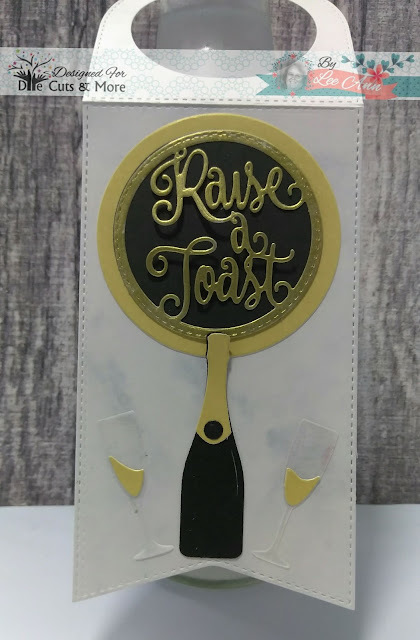 I used a mini Delicata Gold Shimmer ink to color the Raise a Toast ring. The champagne flutes are cut out of vellum and the champagne and bottle top is cut from the same gold shimmer cardstock as earlier. Now for my favorite so far this month with the latest release. I have the Inverted Scalloped Circle Dies, and the first thing I thought of was a bulls eye, From there I went a step further and further into my scrap paper file and went with the bulls eye rainbow. I also used the Lawn Fawn "you color my world" stamp/die set Released Summer 2015 to finish off this project. I used Zig Clear Brush markers for coloring and Kaleidacolor Spectrum pad to stamp the sentiment. My e-z runner was used to affix all the bulls eye layers and 3L foam dots for the Crayons to add a bit of dimension. Thank you so much Claire, and yes I get that too with the u. My best friend is from UK and she gets me with the spellings quite often. LeeAnn, I do believe you have had a lot of crafting fun this past month! The colorful bulls eye is bright and fun. Love the crayolas and bling!! Thanks so much for sharing with Retro Rubber's color inspiration challenge this week. Hope to see you very often in our gallery!! 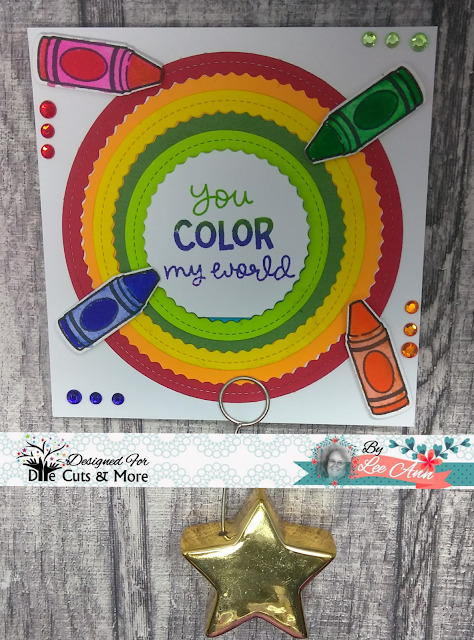 LeeAnn, what a colorful and fun card, Love the concentric circles using all the colors of the challenge, the little Crayons are totally adorable and the bling a fabulous detail. What a great set!! Thank you for sharing with us at RETRO RUBBER, hope you come back and play again real soon. Super cute card with the inverted circles! I thought at first that you were using the negatives with scallop circles but the inverted circles makes it easy! Your stamp set is wonderful and adding the crayons and enamel dots were the perfect touch! Thanks for playing along with Retro Rubber's color inspiration challenge and hope you will join us again soon! Hey LeeAnn, love your card...the colors make me happy! Love the inverted circles and the fun colors you used. Love the crayons and the enamel sits you added. Thanks for joining Retro Rubber's challenge.